I have so many things that I could babble about today, but I promised a proper Tomten Update and I plan to keep my word. At present, I estimate that I have about 60% of the knitting done. Although hoods, I assume, eat up more wool than most of us expect, so my calculations are subject to interpretation. 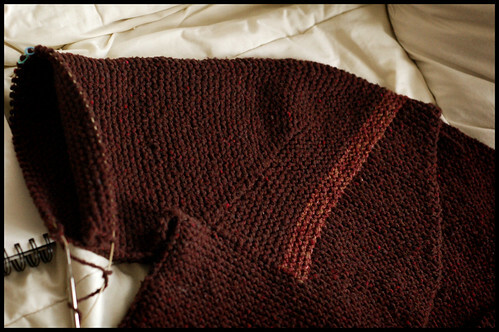 The body is knit in its entirety as well as 2 sleeve caps, only one of which will make it to the final version of the sweater. In conceiving an adaptation of the original Tomten, there were a few areas of the pattern that I knew would need some serious revision to fit my personal taste. The most obvious and problematic for me being the sleeve construction. The current pattern has a schematic that resembles a capital "T", utilizing a sort of very-deep modified drop shoulder. [Here's a good example I found searching flickr.] Now, not forgetting that this pattern is best suited (not to mention intended) for children, this construction is fine and in fact a truly "modular" one, which is by all means part of the Tomten's charm. For me, it won't work though and I welcomed the challenge of figuring something else out while keeping the main design principles intact. I schemed up a few ideas for tackling this problem, one of them involved a gusset, others involved short rows and still others a combination of these and other tricks. In the end, I decided to try the most interesting thing I could come up with - working a set-in sleeve from the top down in the (somewhat odd) space provided. I wasn't sure if it would work, mostly because of all that garter stitch, which has a completely different row-to-stitch-gauge ratio than stockinette. And I've only ever seen this technique successfully executed in stockinette. Pictured above is the armhole just before the set-in sleeve shaping begins (aka boatloads of shortrows). I've blogged this trick before - it's one of the genius techniques found in Barbara Walker's book of all things top-down - and an addictive little trick. (Hark, heel-turners of the world, this one is right up your alley.) Remember, it saved me from pattern issues I ran into with Jarrett. The difference with this situation is, as I mentioned before, an atypical gauge ratio. Since the 'turning' of the sleeve fuses together a horizontal gauge measurement with a vertical gauge measurement within one cylindrical tube, garter stitch threw my numbers off. Following the top-down method as-is, I would have ended up with the upper portion of the sleeve at almost 50% of the body. WAY too many stitches. (In this case, that meant an upper arm circumference of about 21"!) The standard sleeve usually maxes out at the upper arm around 35-40%. In an nutshell, I devised a rate of increasing to be worked throughout the short row shaping of the sleeve cap that more or less lands me at the target 35-40% sleeve number at the conclusion of the shaping. I'm sure this is not nearly as complicated as I've made it sound. Either way, the second picture is the successful cap and the beginning of the regular sleeve knitting (from the top-down, naturally). Now I just have to replicate this on the opposite side (can I decipher my notes? ), finish the sleeves and then it's on to the hood. The hood is really what's gonna power me through sleeve monotony. Lord knows I've had some other fiber related distractions tempting me. Garter stitch resumes with an almost untarnished voracity. Stay tuned for more Adult Tomten coverage. brilliant. Thanks so much for the details on how you're doing this. This is great! I love the slanted lines you're introducing to the pattern, both the neck shaping and the sleeves. Will you re-add stitchs to the fronts when you start the hood? Too clever by half Jared! You're really making this a 'thinking garter stitch' garment. I'm really looking forward to seeing it finished and modeled. WOW. I've learned something! I can't wait to see it finished. I'm loving all the garter. Have you looked at Gaffer's Jacket? EZ did some interesting shaping in the underarms. 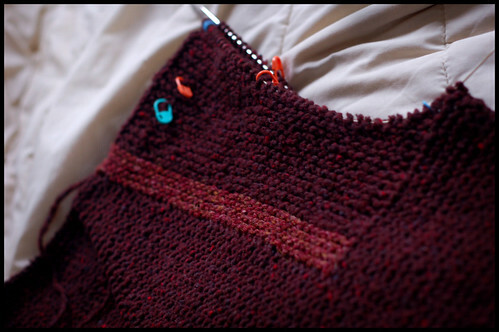 I think there's a photo in my flickr, but it's kind of hard to see the short rows. ohh, I can't wait, this is going to be amazing! Your work is not only beautiful, but fascinating! You make a simple pattern gorgeous. Your choice of colorway and yarn always make the pattern unforgettable... I hope to be Brooklyn Tweed when I grow up! I just bought Barbara Walker's Knitting From the Top. This is exactly why I'm so excited about it (and no seams to sew). Excited that you found a good solution. Very cool. you offer amazing and helpful explanations. always something to learn by coming here. That's looking really good there! Nice sleeve acrobatics. Pleeeease tell me you will be writing all of this down in some sort of summary of how to do the actual calculations, if you don't mind. Thanks for sharing your notes/thoughts. I'm looking forward to seeing the final fit! oh jared yesterday i was too tired to differentiate top from tail now i am impressed though i have also been very impressed with elizabeth's decreases on the top of the sleeve which i cannot figure out if you will be doing too. and i also think lloie looks very smart in her mother's tomten in the opinionated knitter. your wool is so awesome. lovely colours. have ordered loads of yorkshire chunky from janette's myself. she gives it away. 40 bucks for 10 skeins and free shipping. hope the moths haven't seen me order it. awful predator for a lover of wool. i cannot wait to see the finished result. happy knitting and get yourself some really nice coffee with it. I love math but it's the end of my work day and this post made my head hurt. Your sleeve is brilliant and I can't wait to see the finished jacket. Hi, I just stumbled across your blog today. LURVE your work =D and like so many have said over and over: you're an inspiration! Okay I shall shut up now and run back to admire your Flickr...ta~! Love the progress you're making. The colors are gorgeous. Mum's knitting a sweater for herself at the moment. She read so much on other's Blogs about knitting from the top that she decided to give that a go. Do you do short rows for the sleeves and shoulders too ? Mum likes your work, you made good colour choices for the designs you knitted ! I can't wait until you show us when you are finished! I'm on pins and needles. I can't wait to see the FO. I'm really enjoying reading about your progress and design thoughts on the adult tomten. I too am a fan of Walker's knitting from the top down sleeve and found her set-in sleeve shaping to be ingenious. I enjoyed following your thought process and look forward to seeing the final fit. Check out the Suspender Sweater for similarly brilliant garter shoulder shaping. You rule. The Suspender Sweater is an EZ design available as a Spun Out, by the way. She gets all into gussets and shoulders and so on.